As the very new, very inexperienced mom of a three week old who did not have the foresight to make even a single freezer meal, this one-pot pasta is my Official New Best(est) Friend. Times infinity. In fact, if you’re the mom of an ANY year old, or just a person who likes to get dinner on the table in under thirty minutes, I pretty much guarantee that this is about to be life-changing. I first encountered the one-pot pasta a few summers ago when a version involving tomatoes, basil, and loads of garlic made the rounds after it was published on Martha Stewart’s website. If I’m being honest (and I always am), that recipe was pretty lackluster. A good easy weeknight dinner, to be sure, but nothing special. However, what it lacked in flavor, it made up for in potential and inspiration. The concept of a one-pot pasta is so simple – just mix all of the ingredients in a pot and cook until pasta is tender – yet it lends itself to all sorts of variations. This particular rendition is a play on everyone’s favorite spinach and artichoke dip. 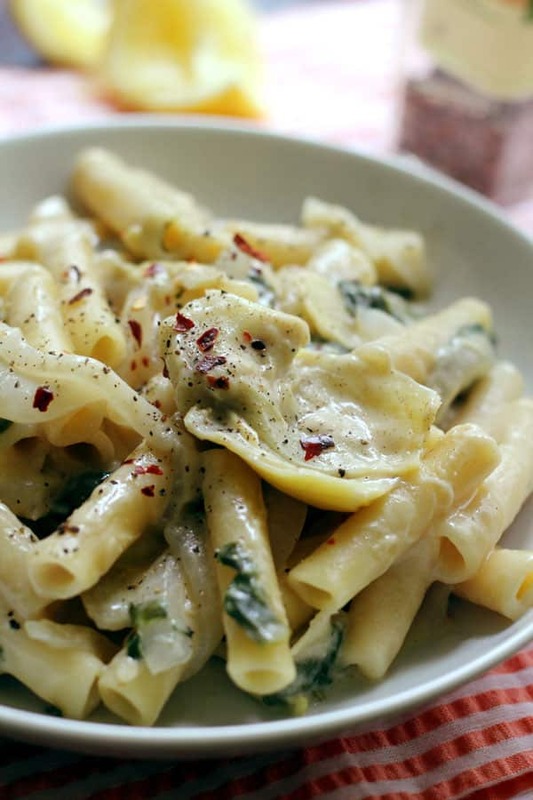 In place of tomatoes and basil, spinach and artichokes are simmered away with the pasta while white wine and evaporated milk are substituted for equal volumes of water for added flavor and creaminess. Parmesan cheese and lemon juice are stirred in at the end to help the sauce thicken into something akin to an alfredo. Feel free to serve it with extra cheese, red pepper flakes, and freshly ground black pepper – my favorite “not necessary”, but always welcome pasta accompaniments. All you need is one pot and 25 minutes to make this easy weeknight dinner. 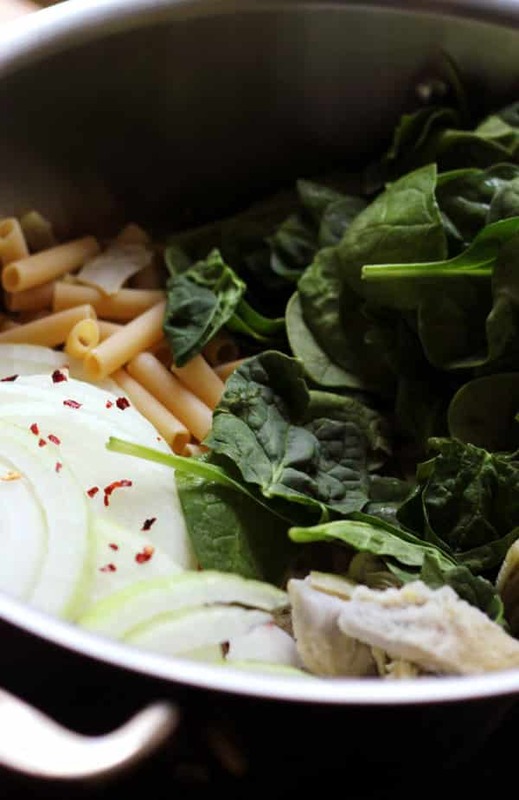 In a large pot, combine the pasta, onions, garlic, red pepper flakes, baby spinach, artichoke hearts, olive oil, salt, black pepper, water, wine, and evaporated milk. Bring to a boil over medium-high heat and let simmer, stirring often, until the noodles are cooked to desired consistency and the sauce has thickened, about 12-15 minutes. Remove from the heat and stir in the parmesan cheese and lemon juice. Season to taste with salt and black pepper. Allow to sit for 5 minutes, stir again, and then serve warm. Joanne Bruno is the blogger, recipe developer, and photographer behind the mostly ridiculous and always delicious vegetarian food blog Eats Well With Others. She likes her vegetables with a side of cupcakes and takes a highly hyperbolic approach to most things in life. This looks great! What would be the best milk substitute for this recipe? I made this recipe earlier but vegan! I used a can of unsweetened full fat coconut milk instead of the condensed milk. I also used quinoa pasta which didn’t do great with the recipe. I substituted some of the water for mushroom broth to give it more flavor since it wouldn’t have Parmesan in it. Overall, I would say it’s a good recipe but I thought it didn’t taste like much maybe because it cooks so quickly and frozen artichokes also don’t have much flavor in my opinion. Still a good recipe though if you’re craving something light but creamy. Followed the suggestion to use coconut milk and used a can of artichokes. Great dinner. I’ve made several one pot pastas but sadly this one was a flop. Totally lacks flavor. OMV has a ton of great recipes but unfortunately this isn’t one of them. Has anyone tried making this recipe the traditional way rather than a one pot dish? I ask because it sounds like a great recipe and seems to me that the flavors would meld together better if cooked in stages, then put them all together.